Our ring blanks come in packs of 12 silver plated ring bases. These blank rings have a beautiful, professional looking finish. Anyone can be a jewelry designer with these easy to use ring blanks for jewelry making! Each adjustable ring base is coated in silver plating and are adjustable to fit virtually any adult ring size. 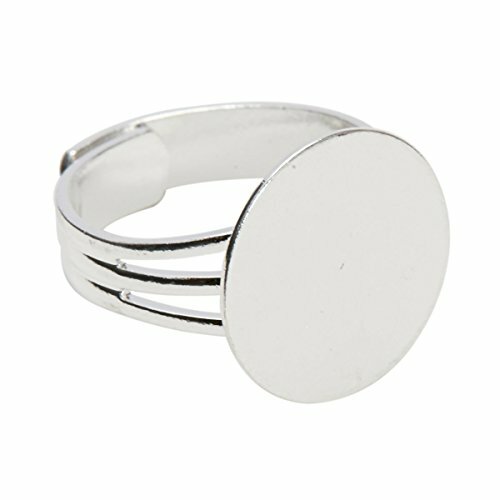 These silver plated blank rings fit nearly every adult ring size. Our lead- and nickel-free ring blanks are safe and comfortable to wear. Easy to adjust to about any size, you can comfortably wear these adjustable ring bases on any finger. However, we do recommend that these ring blanks for jewelry making are for adults only. The wide base makes these ring blanks particularly comfortable to wear, no matter the size of the embellishment. Our blank rings have a large 16mm flat base and a wide band at the top of the base. Glue-on nearly any size cabochon, gem, natural stone or whatever other embellishment you can find! It's easy to get creative these beautiful ring blanks for jewelry making. Buying in larqe, bulk quantities is a convenient way to craft! Each adjustable ring base has a gorgeous base that looks great and makes beautiful costume jewelry. Make fun DIY jewelry for you and your friends! Beautiful and original crafts don't have to take hours and cost lots of money because as everyone knows crafting is for the soul! Bits & Bobs: Crafting Components is our original, private label line of crafting elements, embellishments, findings and parts. Get crafty and creative with Craft Making Shop! If you have any questions about this product by Craft Making Shop, contact us by completing and submitting the form below. If you are looking for a specif part number, please include it with your message.